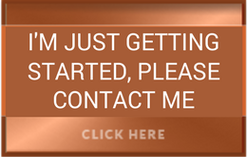 Once we have determined a handful of the most appropriate financing sources within or even outside of our Network of Lenders, we can begin to assist you in preparing a well thought out and properly detailed application submission. Depending upon the lender there is documentation that must be included, some that isn’t necessary and some that really should be purposely omitted. 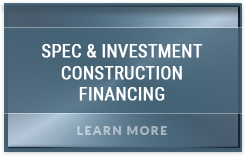 We are highly experienced construction consultants that by including assistance with obtaining financing can bring savings to our clients equaling several thousand dollars or arranging financing where no one else could. While we are not a mortgage broker or lender, but our clients receive significant value from our assistance with assembling all the documentation and customizing it according to a particular lenders’ requirements. 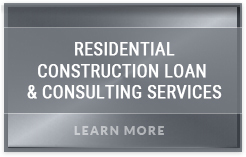 Our Extensive Network of Preferred Lenders has taken us years to develop and requires considerable research to refresh and replace where necessary. In that many are non-bank or mortgage companies, they can have vastly differing regulatory requirements and restrictions. 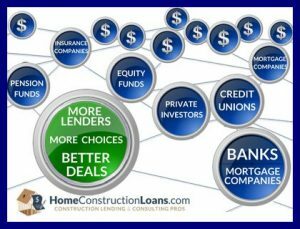 To those bank or mortgage company options, which can be counted on one hand in today’s market, we add far greater access through Independent Investors, Private Equity Funds, Insurance companies, Credit Unions and various Retirement funds. Niche lending from within these firms often provides the flexibility needed to bring our clients a specific solution to an absolute requirement. Once the lot and home construction markets begins to show signs of new life on a national level, we’ll be the very first to bring it to our valued clients. 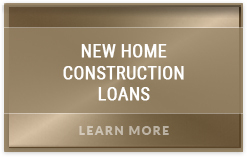 We begin with a standard home loan application and typical income, assets and liability documentation. 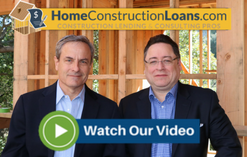 While there are some special requirements for what’s known as the borrower credit package, the significant differences come with the Builder Review and Project Feasibility review.